This weekend I did a little trade with my Mum, she cooked all weekend and I sewed her a new wardrobe. 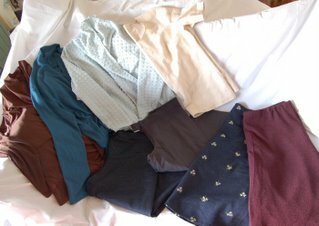 Two pairs of trousers, two skirts and four tops, she is a very happy lady and looks very stylish. My Mum cooked chilli, tattie soup and roast chicken, cauliflower with cheese sauce and potatoes, yummy, yummy! Sunday we took a walk to the market and I found two rolls of tie silk, I thought it would make nice bag lining, one roll has lots of different patterned pieces on it. Jamie has his eye on it though, he wants to line a waistcoat with some of it. No pictures of it yet though, soon…. Does being a knitter automatically go hand in hand with a love of chocolate then? Or did I just catch you all on a weak day when the chocolate looked too tempting???? I have pictures of chocolate brownies with Rolos in the centre to post but not today, I’ll save that one! Brownies with Rolos in the centre – yummm! I’m drooling already, even without a picture. wow that’s a lot of sewing. one of these days you’ll have to tell us how you ended up in France. as for chocolate. I think I love only the very, very good chocolate and only in small quantities. Having tasted one of the aforementioned Rolo Brownies, I can vouch for their fabness. Also, having seen a large part of the sewing extravaganza’s results, I can vouch for their fabness too…. I hope you took a picture of the brownies because I suspect they won’t last long! Oh, what a wonderful trade with your mum!! I’m in a sewing mood too at the moment. I bought some lovely embroidered organza half price in the JL sale so I’m thinking maybe a little 3/4 sleeve blouse but I’m so lazy these days I’m going to have to get a pattern as I can’t be bothered working it through from scratch ! I ate too much chocolate over Christmas so I’m on a chocolate fast now. That just means there isn’t any more in my house. If there were some, I’d eat it. I’m curious about tattie soup. I’m sure it’s delicious but what are tatties? Maybe potatoes? How lovely to have your mom cook for you. My mom is elderly, she can still cook simple meals for herself and my dad but when we visit, we take the whole feast along so she doesn’t have to do anything except set the table. Wow!! That is a lot of sewing for one weekend!! Hmm, yes, maybe chocolate is suited to knitters. Interesting. Fantastic sewing marathon, you are a speedy worker, well done.